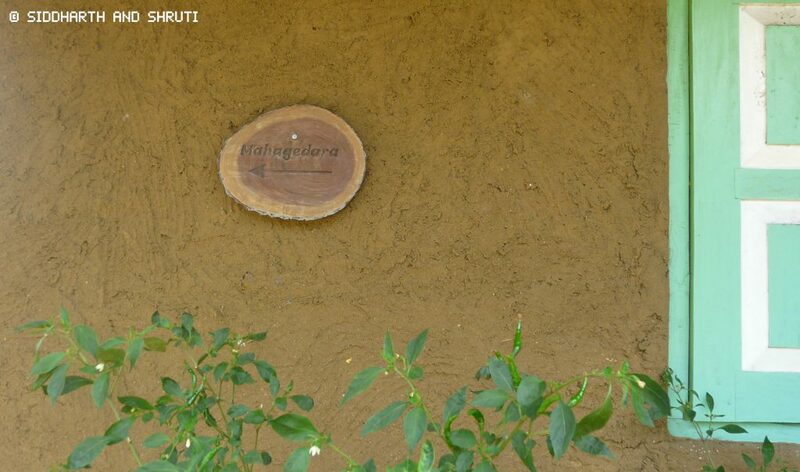 Mahagedara eco retreat is more than just accommodation, it is an experience. An unforgettable experience that will stay with you even after you leave the retreat. 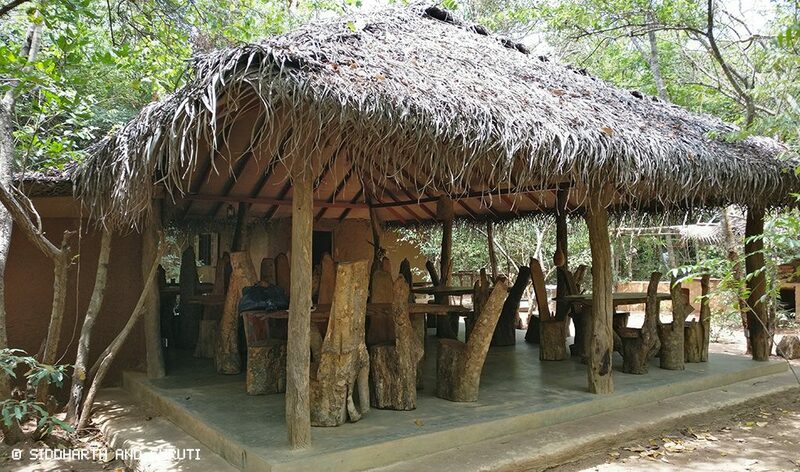 This rustic retreat hidden away in a small village near Sigiriya will make you feel like you have entered a whole different world altogether. 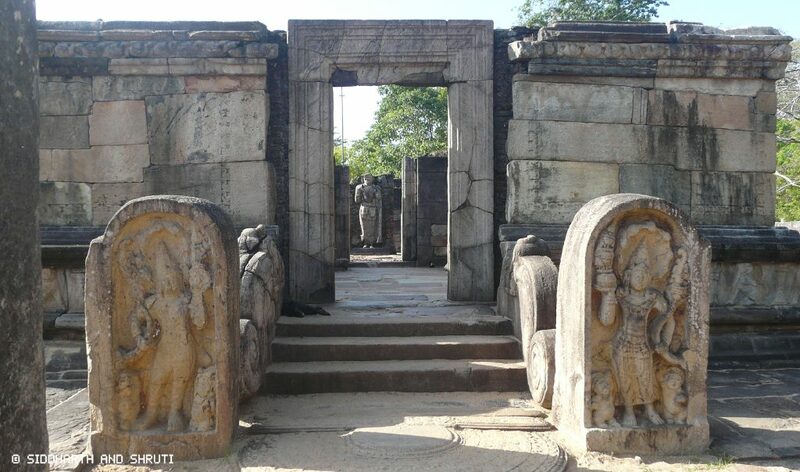 Fair warning though, once you enter Mahagedara, you may not want to leave! 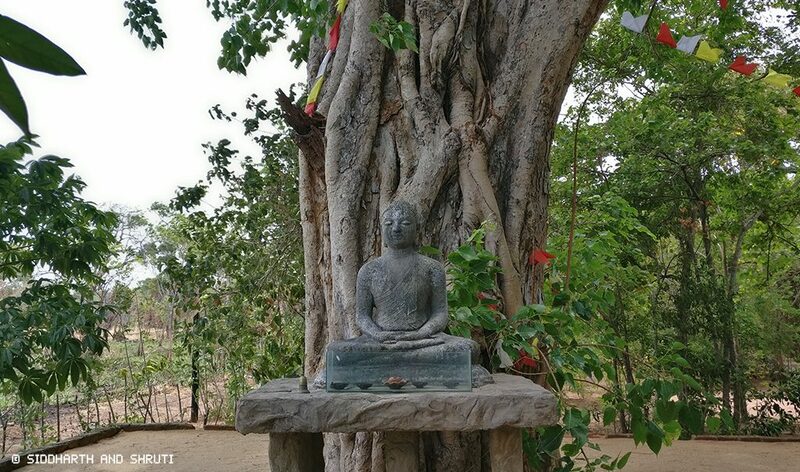 Mahagedara is all about consciousness and slowing down. The smell of the earth, the aroma of the flowers and the clean air will make you forget about all your worries. We were greeted by two smiling staff members who very skilfully chopped a king coconut for us on arrival. 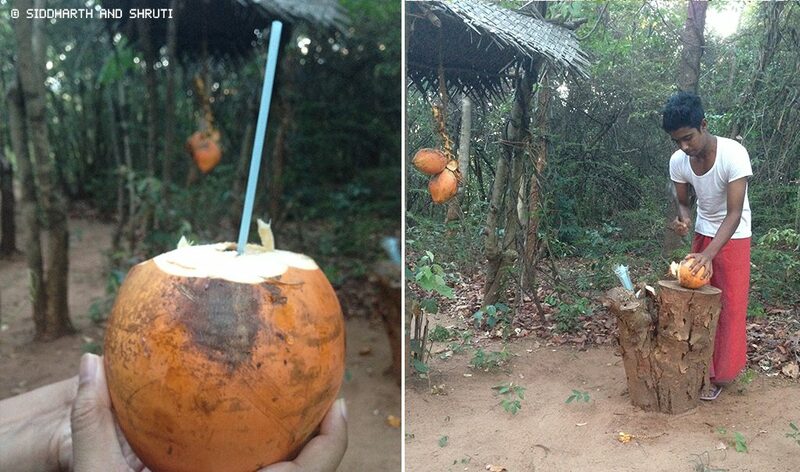 After a long journey, the drink was really refreshing and such an authentic Sri Lankan experience. You cannot come to Sri Lanka and not try the king coconut! 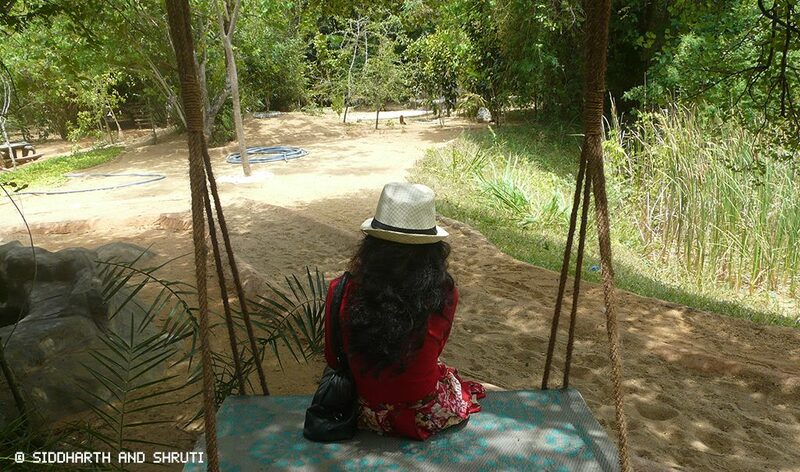 Most of us lead busy lives and are in dire need of some relaxation time to restore our energy. And that’s where coming here can really benefit you. 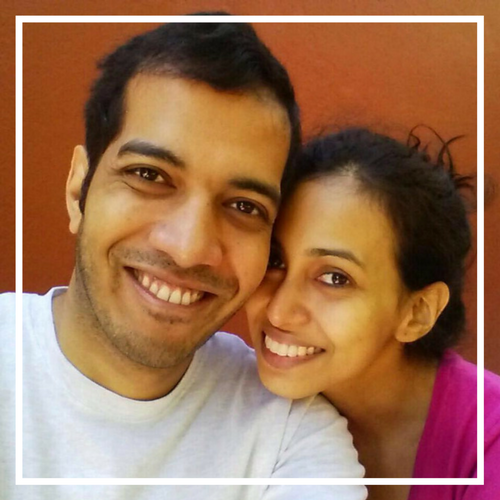 In case you don’t know, we live in Mumbai, work really long hours and manage the blog in our spare time. Which means we never get a chance to go to bed early. The most sleep we get on work days is 7 hours. Never once do we feel like we have slept enough. 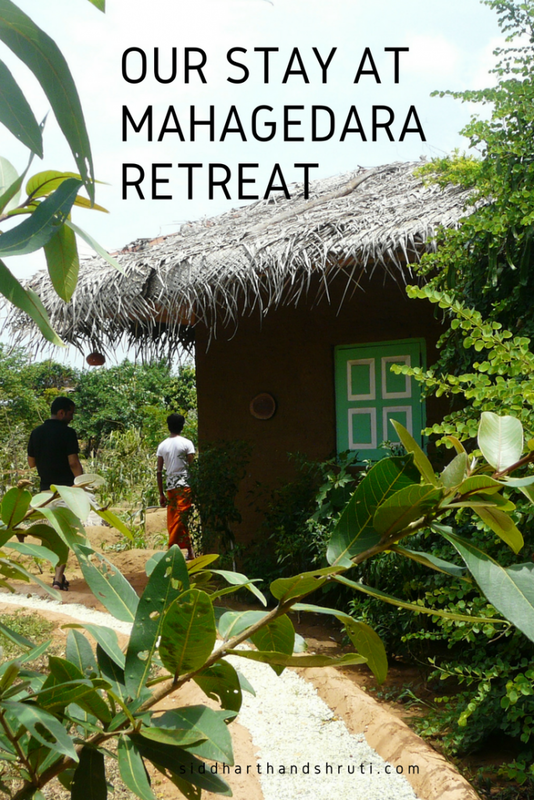 Since Mahagedara retreat is situated in the forest, once the sun is down, you are recommended to stay in the room. For the first time in our life, we ended up sleeping at 9 pm and waking up at 6.30 am completely refreshed. Can you imagine us saying we woke up without an alarm at 6.30 and were happy about it! 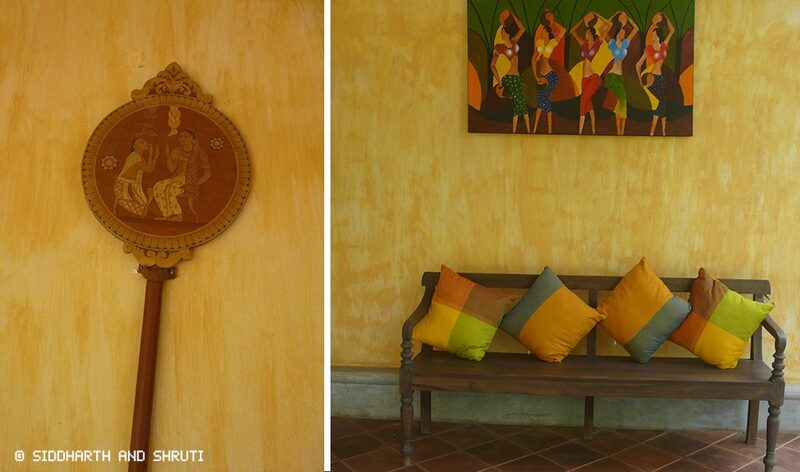 You can choose from six different experiences – Simply Be, Family, Relax & Pamper, Detox, Living the Ayurveda Way, Accessing Consciousness. All these experiences are customized as per each individual’s requirements. More details on their website here. 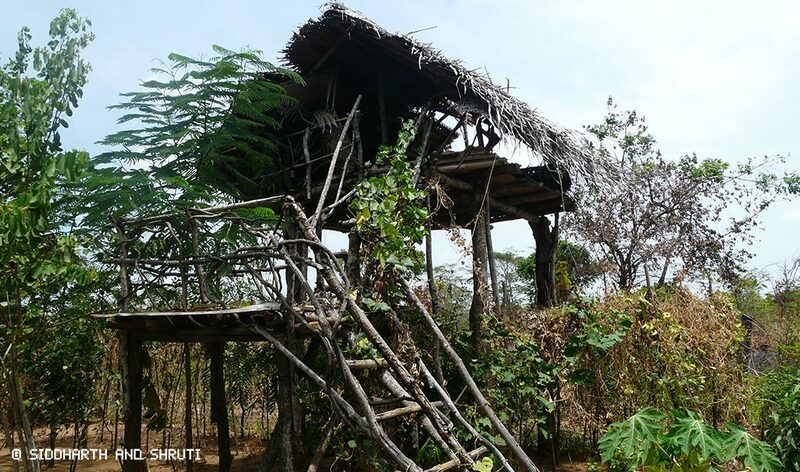 The accommodation is a hut with a private bathroom and a porch. 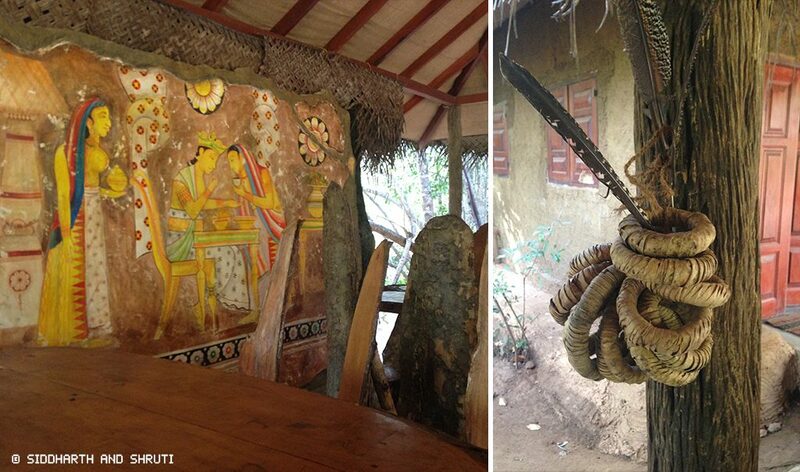 The decor is locally sourced and makes use of trees. 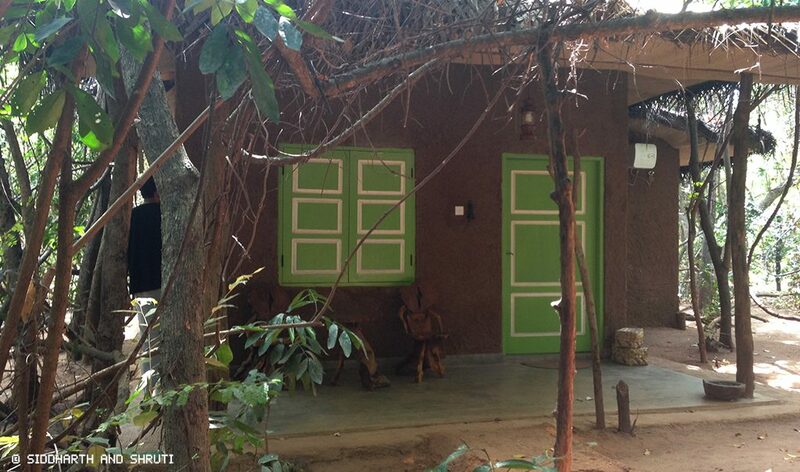 Despite the rural look, it is air-conditioned which is a great benefit if you are travelling in the hotter months. 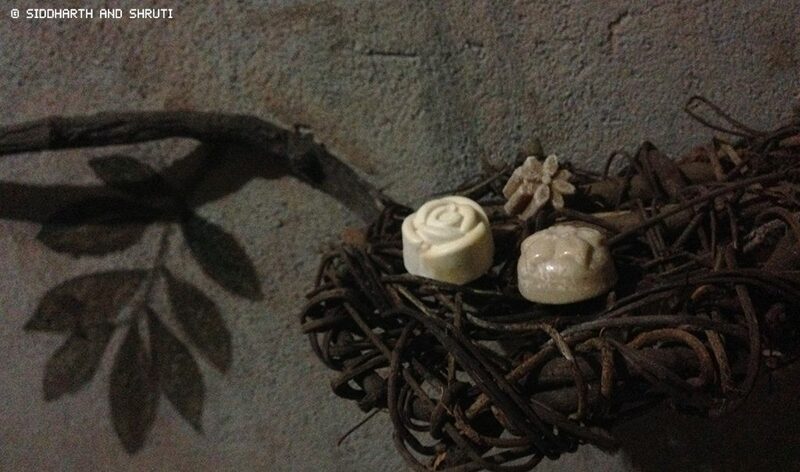 We loved that the retreat had these small touches that were memorable. Like the soaps. 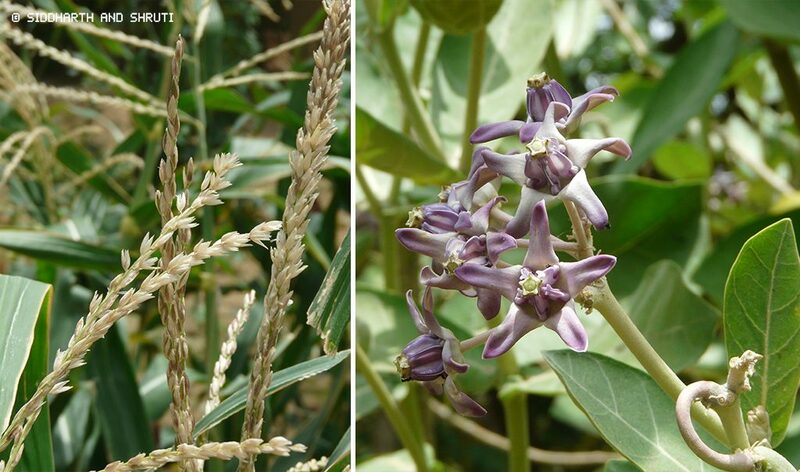 They were shaped like flowers and placed in branches. Now, isn’t that dreamy? The bathroom sink is a quirky mix of rural and urban. The most unusual sink we have ever seen. The food is a spread of absolutely yummy Sri Lankan dishes. It is served in clay vessels. Everything here is eco-friendly. No plastic anywhere. 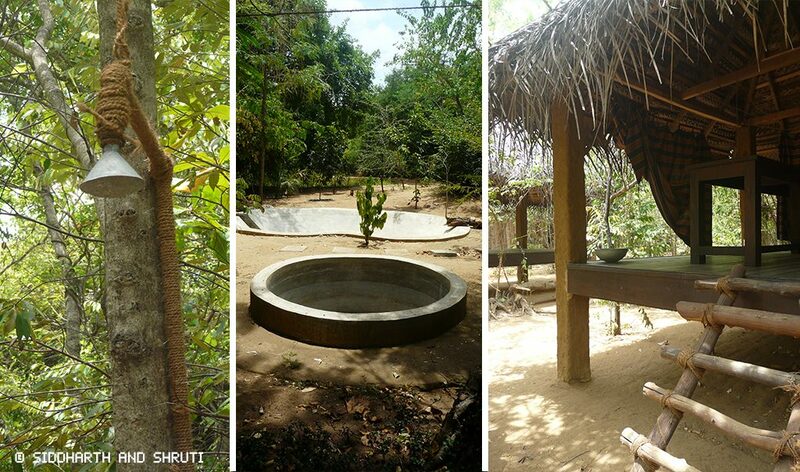 If you support eco-tourism, then this is the place to be! 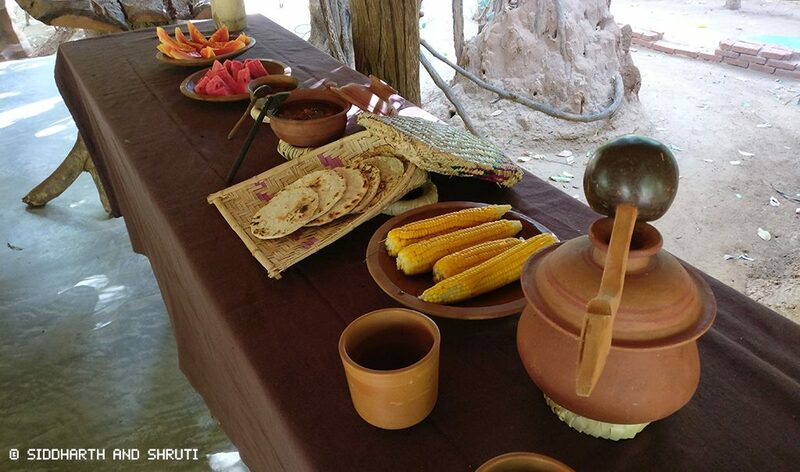 The food is all organic, most of it is grown within the resort itself. The flavours are so finger-licking good, that we cannot even put our glee into words. The dining area is also pretty unique. 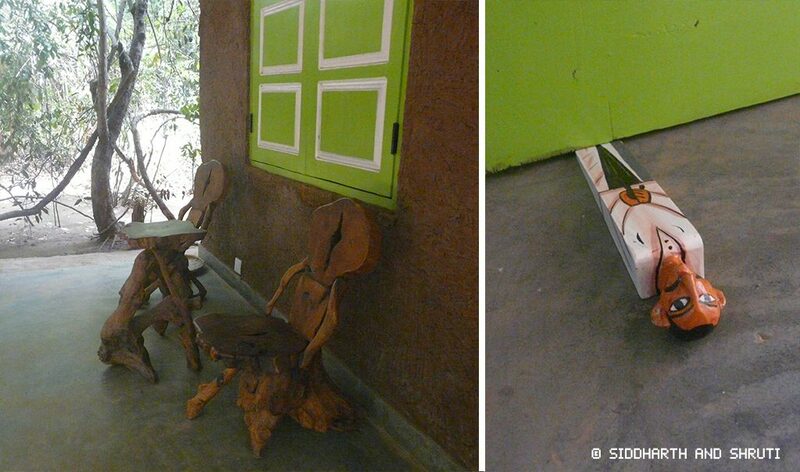 The chairs are tree barks. And the roof is dried leaves. 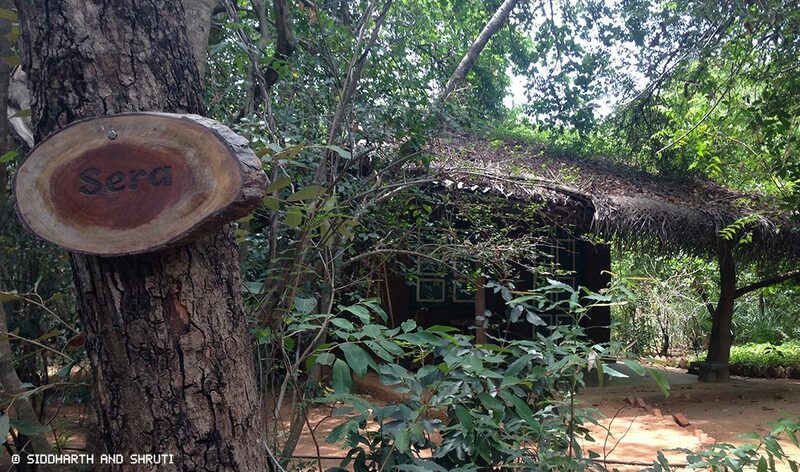 We stayed in a treehouse before this stay and were familiar with living around forests. But to those who have never stayed surrounded by nature, be careful with where you step especially at night. 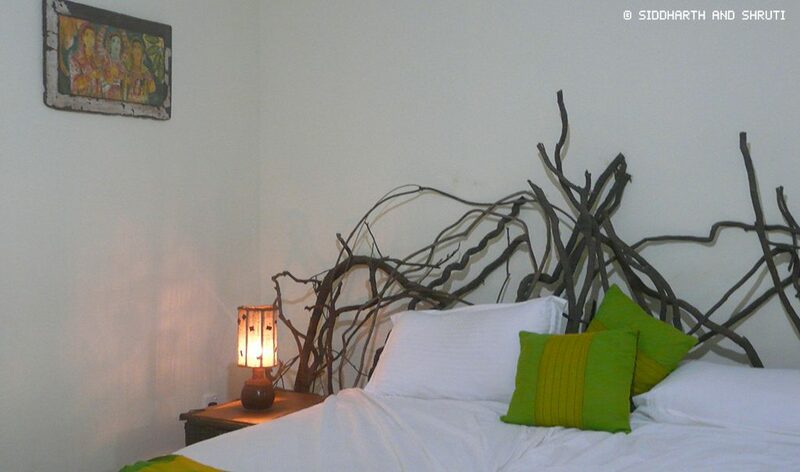 The room has a flashlight which you can use while walking from your hut to the dining area. 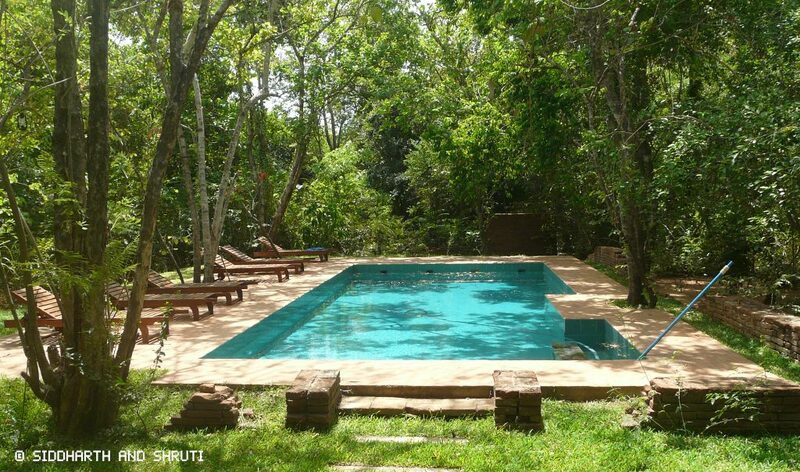 Just when you thought this retreat could not get any better, they have a swimming pool right in the middle surrounded by trees. It is even lit up beautifully in the evenings. There are deck loungers and towels available. 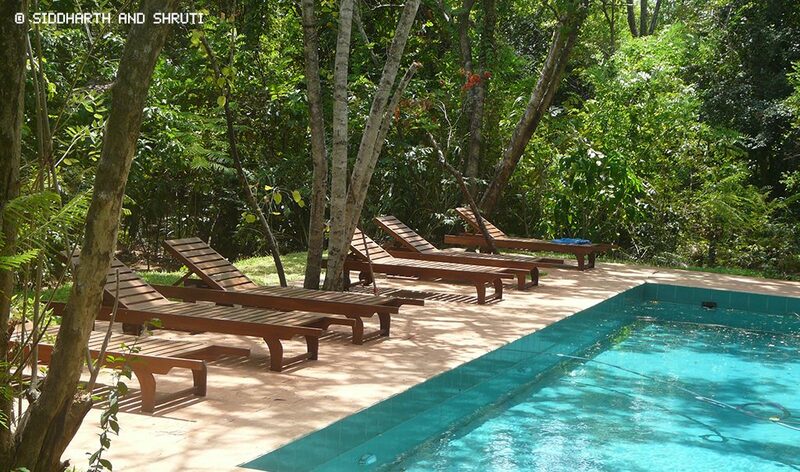 Right next to the pool is the ‘Mahagedara’ room. It is a family room with wi-fi. Not that you would want to be bothered by the outside world. There are also tons of books which you can enjoy. We especially loved the lounge chairs overlooking the pool. A small warning, put on insect repellent in the evenings. Due to the proximity to the pool and the trees around, there are bugs and mosquitoes. 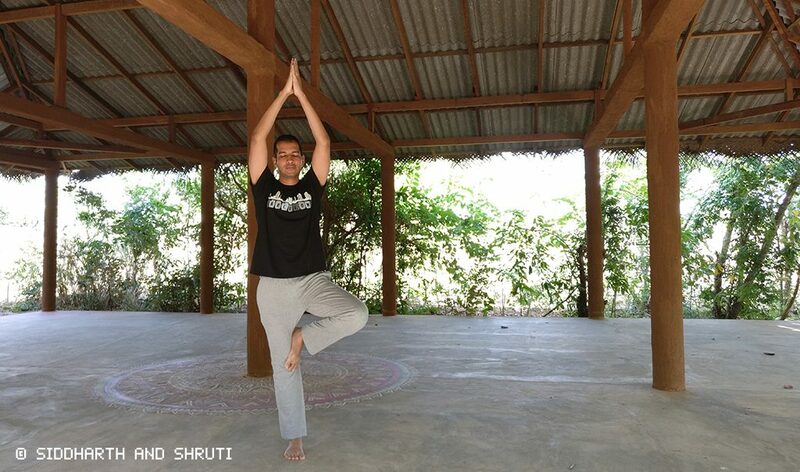 How could an eco-retreat not have a yoga shaala? They have a big one where they hold classes everyday. Focus on your breathing, meditate and de-stress. 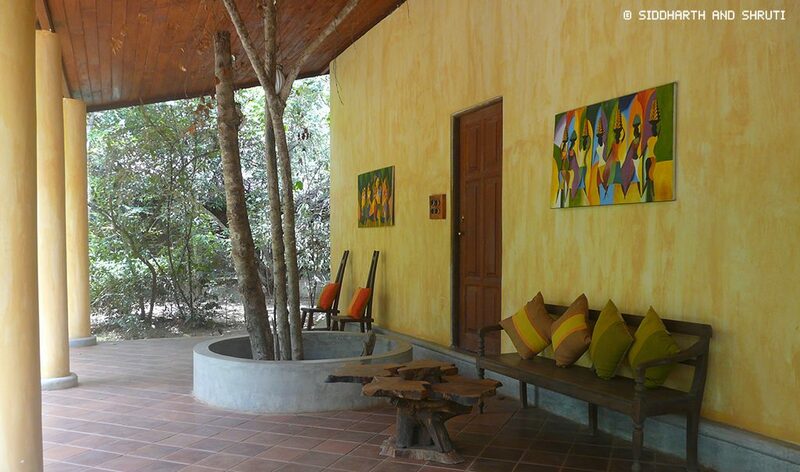 Along with Yoga lessons, they also offer spa treatments and ayurveda based on the experience you choose. You can even get Ayurvedic treatments based on what your body needs. 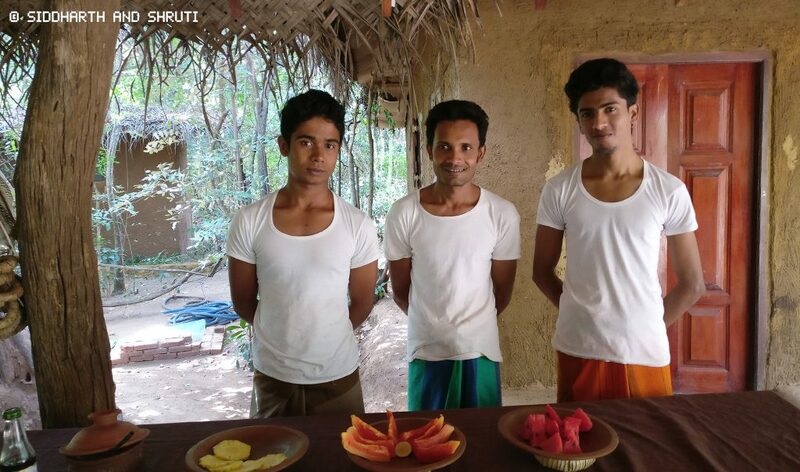 Ayurveda has three body types – Vata, Pitta and Kapha. After determining where you fit, you will be recommended what foods you should and should not eat. The spa area is really beautiful. It is adjacent to the gardens and feels very tranquil as it should. 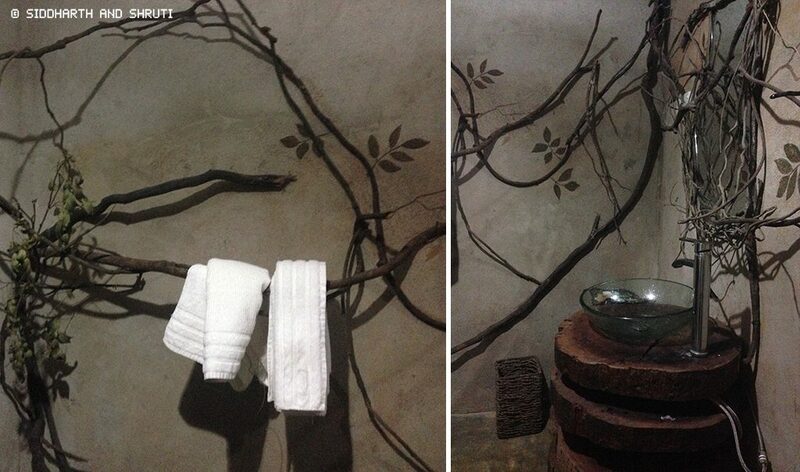 Whether you decide to take a herbal bath in a stone tub or a full body massage, you will truly feel at peace. The staff: We cannot end this review without mentioning how warm and lovely the staff was. The owner, Lakmali was unfortunately not in the country when we visited, but still made sure that she spoke to us over the phone and our needs were taken care of. Right from the first email, she was very helpful and gave us suggestions on what we could do in Sri Lanka especially around Sigiriya. 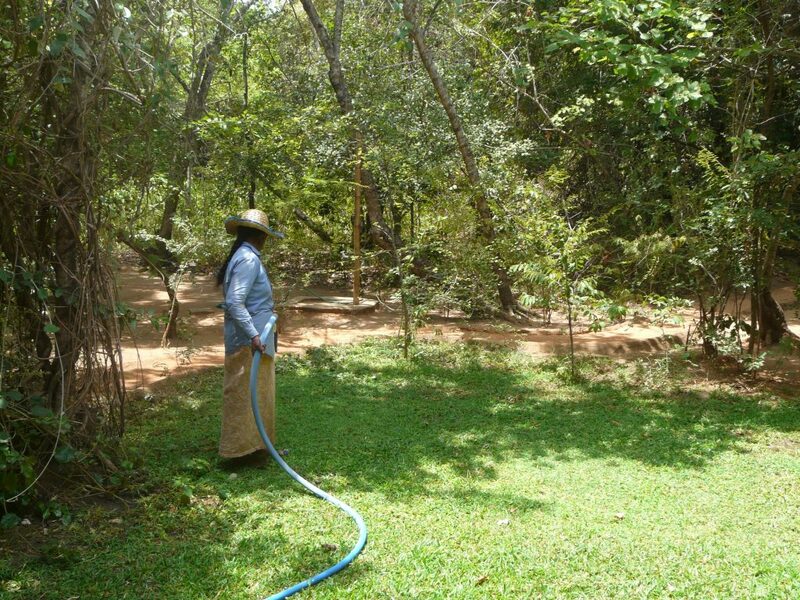 The on-site staff was very attentive and even served us a really early breakfast on the day of our Sigiriya trek. 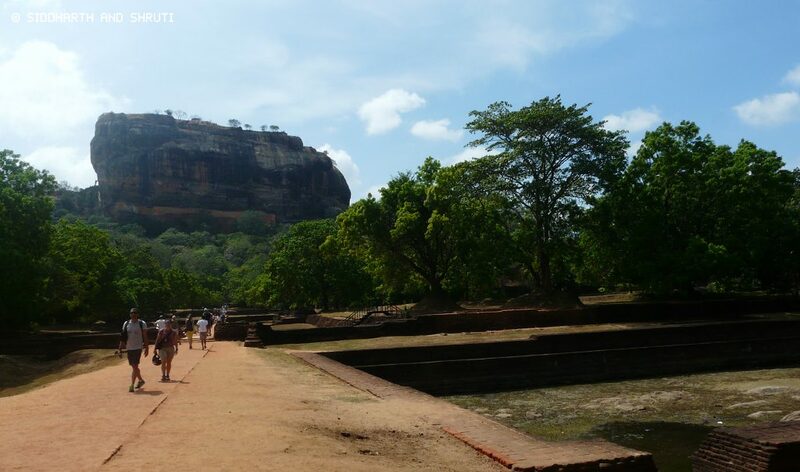 The Sigiriya rock, Pidurangala Rock, the ancient towns of Anuradhapura and Polonnaruwa, Dambulla are a few things you can visit while you are here. There are also Minneriya and Kaudulla national parks around for safari lovers. 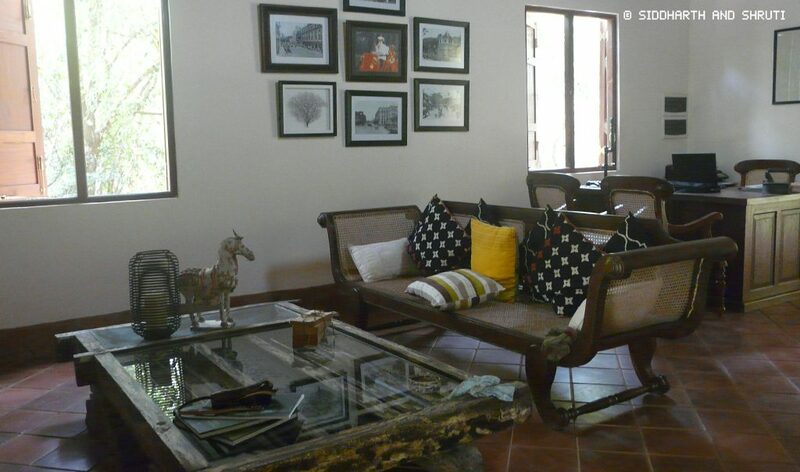 The retreat can arrange a pick up or drop for a fee to your next stop in Sri Lanka. A pick up can be a good idea, since Mahagedara is hidden away in a village. Like us if you have rented a car, you can call the resort and they will patiently guide you. Glad you got to visit! I loved Sri Lanka, too! This looks like such a beautiful eco retreat. So going the Living the Ayurveda way if ever I was to visit. Love that its in such close proximities to National Parks and ancient towns. Bet the food was delicious too! I love coconut too 🙂 I could only have it in exotic places because in Italy you cannot find it unfortunately. I feel so good just from reading this post! 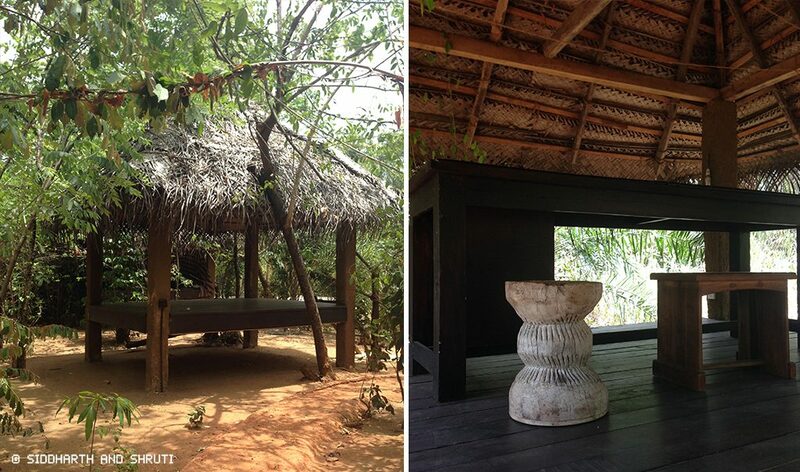 This looks like the perfect eco retreat, with a good mix of wellness too. Your accommodation looks fab, and I wouldn’t say no to a night here! 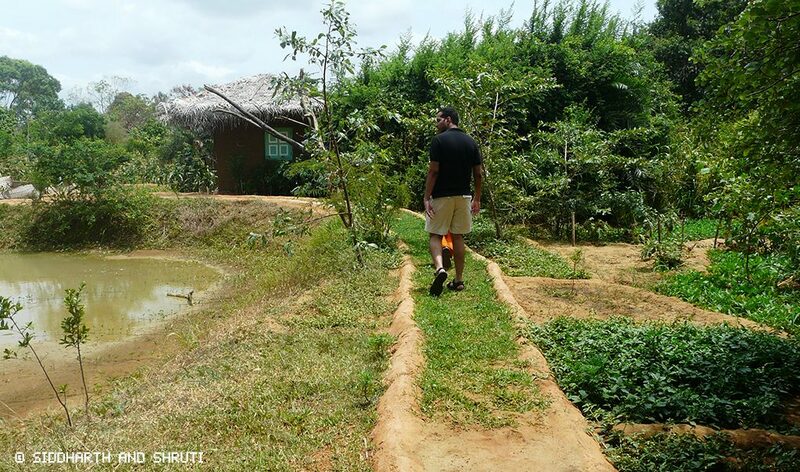 Thanks for sharing this hidden gem of Sri Lanka! It looks like a great place to retreat away from the hustle and bustle of city life and jump into the embrace of Mother Nature. Amazing! This really is a true retreat! I absolutely love the details – like the fact that they greet you with a fresh coconut drink, the towel racks that are made of vines, and that pool! Oh my goodness, I could spend all day there! Very attractive place. Thanks for sharing.